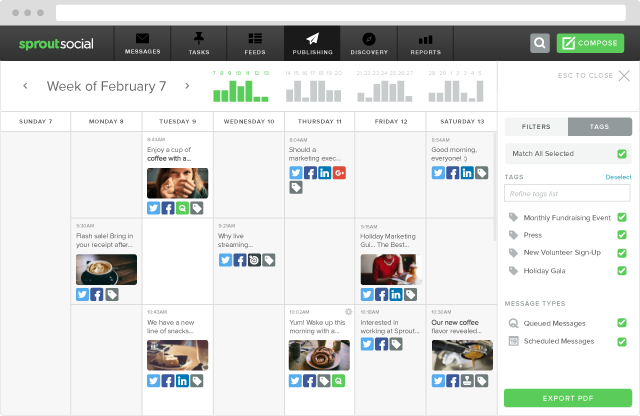 Late last year, Sprout gave your team the ability to visualize and plan its social content with a cohesive publishing calendar. Over the past few months, we’ve been hard at work adding new features to make the calendar an even better tool for your team to collaborate and plan social content and campaigns. 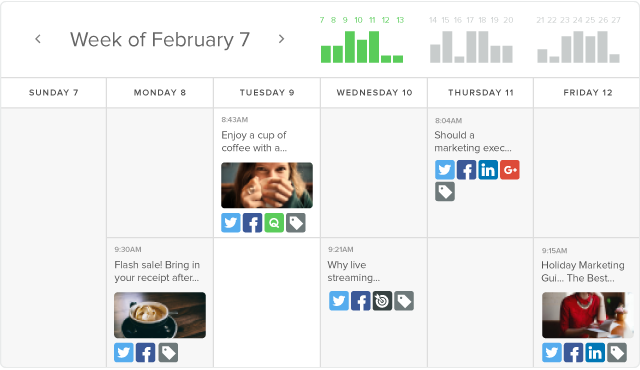 The new message volume indicators across the top of Sprout’s publishing calendar provide an at-a-glance, four week view of the amount of content your team has scheduled. The bars help you quickly identify and fill publishing gaps to ensure you have a balanced social content calendar across networks, profiles and campaigns. Message volume indicators are compiled into four groups, each group representing one week. Individual green bars represent the days within the week you are focusing on. Hover over any green bar within the message volume indicator to see the total number of messages scheduled for that day. Click on any group of volume indicators to quickly jump to that week. 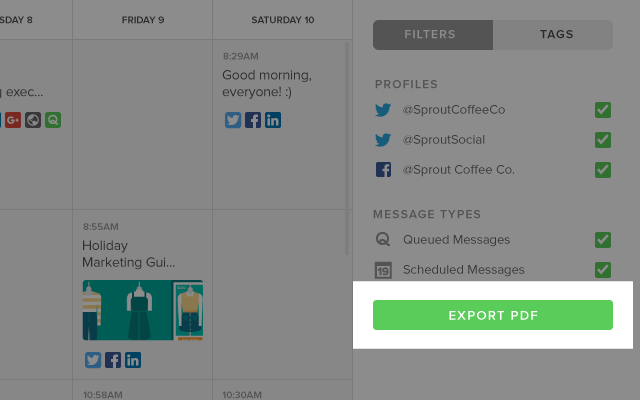 Sprout users that are already using Message Tagging (Professional and Advanced plans only) from Compose can now leverage those same tags to better visualize their scheduled content on the Publishing Calendar. The updated social media Publishing Calendar navigation bar now includes a toggle to organize your calendar view on Tags or a range of Filter options. Viewing the calendar with selected tags lets you easily isolate content tied to a specific campaign, brand pillar or strategy. To learn more about how you can use Message Tagging to work smarter and more efficiently, check out this Sprout product guide. With team tools and workflow management like tagging and Message Approval, Sprout’s publishing suite is truly built for seamless, online collaboration. Still, we understand that it’s necessary to have the ability to download and print your calendar to share it with a manager or client-side contact. Now, you can easily export the Publishing Calendar into a PDF by clicking the green button. In a few seconds, you’ll have a beautifully designed social calendar that you can print and digitally share with key stakeholders outside of the Sprout platform—a great tool for agency teams. Whether you’re a small business with big publishing goals, an agency looking for the flexibility to manage multiple client calendars in one place or a global team in need of enterprise social media tools, these recent enhancements to the Publishing Calendar will help you more effectively achieve your goals.